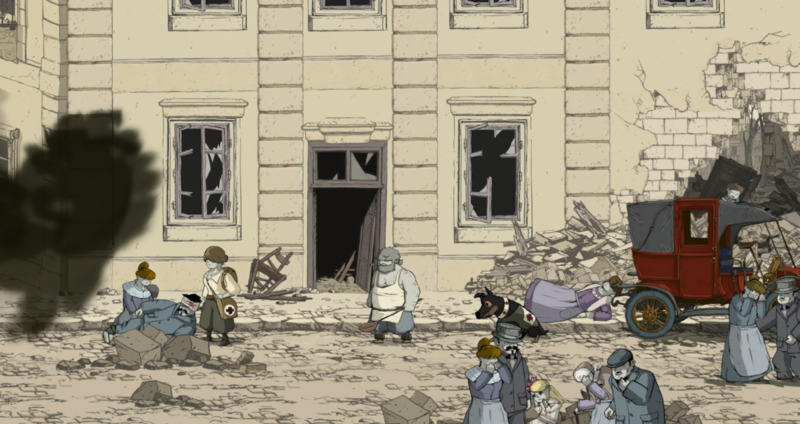 After a harrowing escape from Baron Von Dorf's zeppelin and a careful trip through enemy trenches, Emile, Freddie, Anna and the dog have arrived in Reims. The city is under attack, like most places in Europe, and they'll have to be very careful on their trip through - starting with not getting separated a second time. Hopefully. Tread wisely, Freddie. - You start off below the street. Wait for the bombs above to abate, then quickly climb up and out of the hole. Run right, weaving through bombs as they hit the road. - Over to another part of Reims. 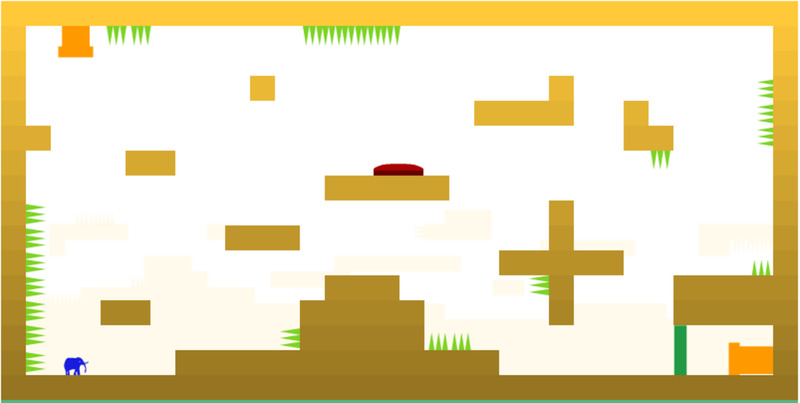 Your first major objective is to move a huge stone tablet in the road. You need more people to get this done. - First thing's first. Head towards the building on the left. The dog will pick up a scent. Have him dig to find an Advertising Brochure. - Go left. You'll find a wounded man near a fire. Send the dog in to drag him out. Grab the lever he drops when saved. Make sure the dog does this - Emile will choke to death in the smoke. 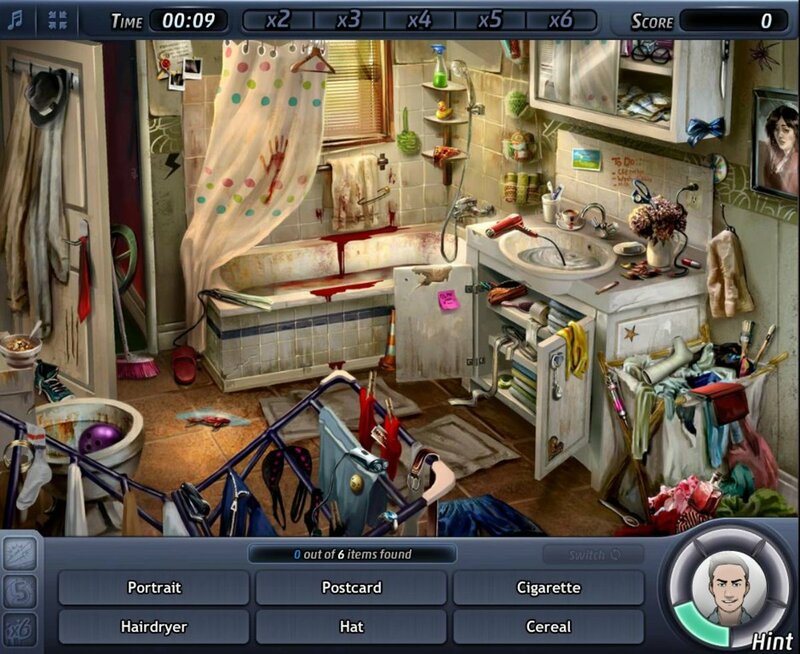 - Head to the far right, into a building where a man is calling for help. Turn the wheel at the far end of the building, then go down the stairs beneath the incomplete lever up top. 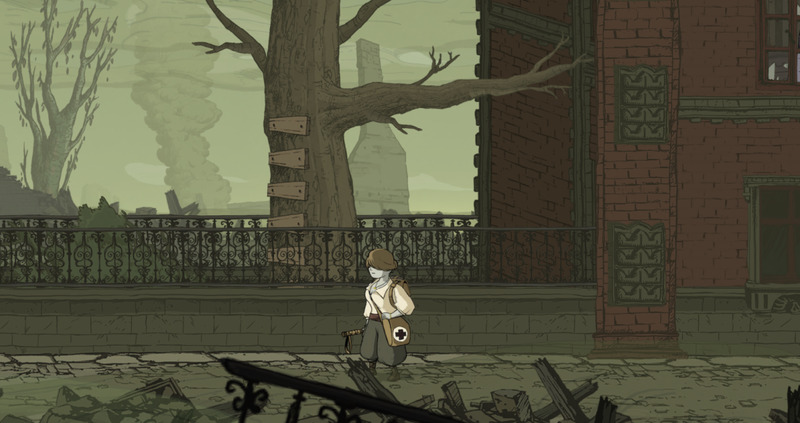 Emile explores the ruined streets of Reims in Valiant Hearts. - Look to your left at the bottom of the stairs to find some Overalls, then go right. Tell the dog to sit on the dumbwaiter you lowered before. Then go back upstairs and turn the wheel so the dumbwaiter rises to the top floor. - Direct the dog to give the lever to the man. Then have the dog pull the switch. All that done, bring the dog back down via the dumbwaiter. If you spare a minute to take Emile up top and check the cupboard up here you'll find a Safety Razor inside. - Return to the main crowd of people and enter the building on the left. There's a little girl to your right in the first hall. Pull the cabinet in her way to the left so she can escape, then push it back right to get at the wire cutters near her former hiding spot. - Go up one floor. On your left is a guy who needs saving, but you can't get at him yet. Go all the way right first and check a beige cabinet near the end of the floor for an Early Gas Mask. - Climb the ladder on this floor to get to the third floor. Head left and you'll find a wire to snip with the cutters you found earlier. Dropping the sign below will allow the man on the left to flee. Have the dog check the balcony where he was stranded for a War Godmother Certificate. 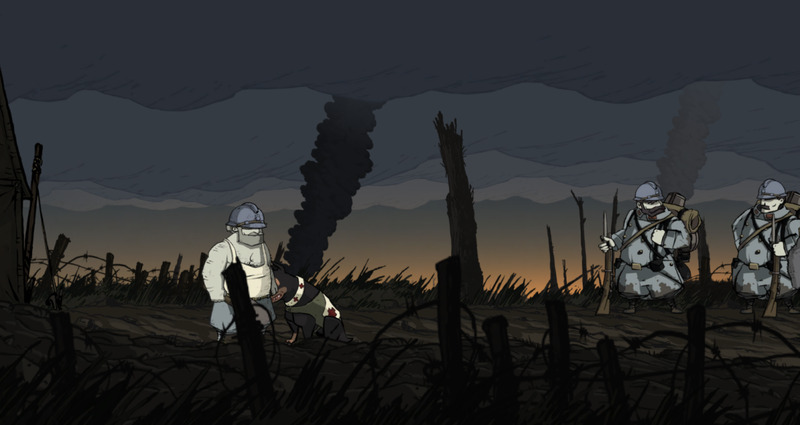 - Return to ground level and speak to the three men you saved. They'll help you push the tablet blocking a hole in the ground out of the way. Drop through and into the ground. - Now you're in the same spot where Freddie was earlier. Walk all the way right and you'll find a hidden Active Service Pay Book. Then ascend to ground level and head right. Your first boss fight awaits. 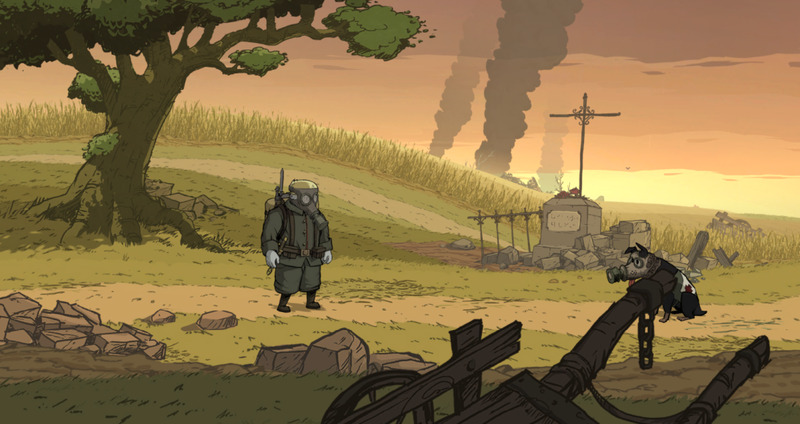 Emile battles Baron Von Dorf in Valiant Hearts. The Baron himself. 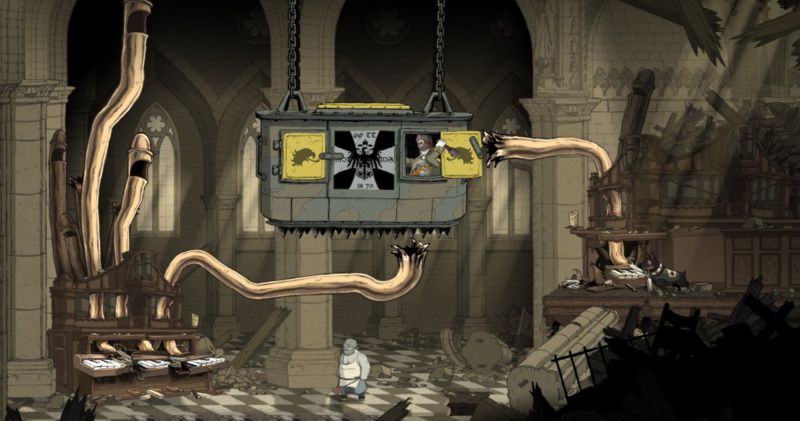 Von Dorf is in a small metal gondola car, and he's suspended near the twisted wreckage of a pipe organ. He'll linger up here and throw grenades down at you. You need to dodge the grenades and find a way to take him out. The solution? Use the remains of the organ. The compartment is hanging near four pipes which you can blow by hitting the appropriate keys. Do this enough times and you'll take him out. The lowest pipe is the set of keys on the right side of the keyboard; the middle pipe on the left is the middle set of keys; the top pipe is the left set of keys. The dog can also help by hitting one other set of keys, triggering the pipe on the right. 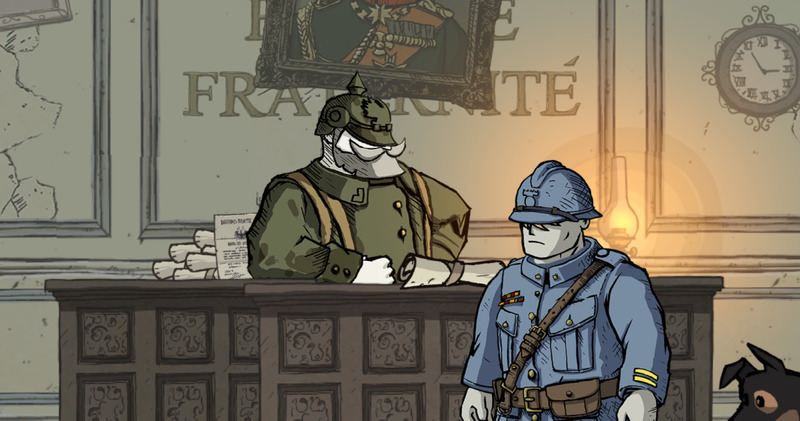 Note that, at least for the last sequence, the Baron has to be holding the grenade before you trigger the pipe. (Correct me if I'm wrong on that.) 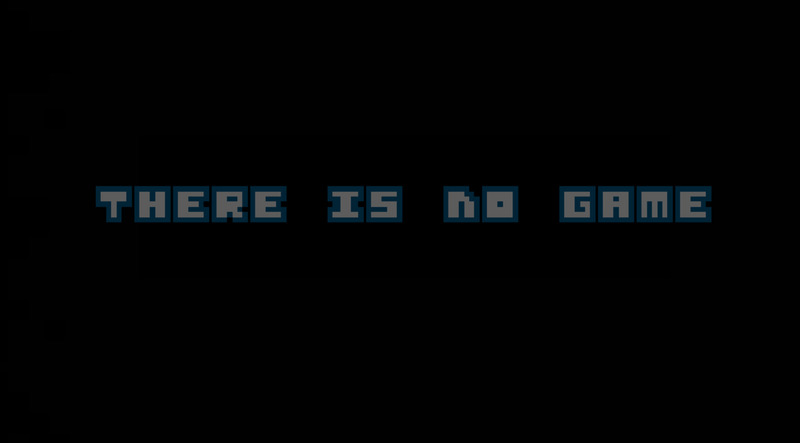 You may have to mess with the pipes some more if you take too long, as well. Three hits and the guy will flee. 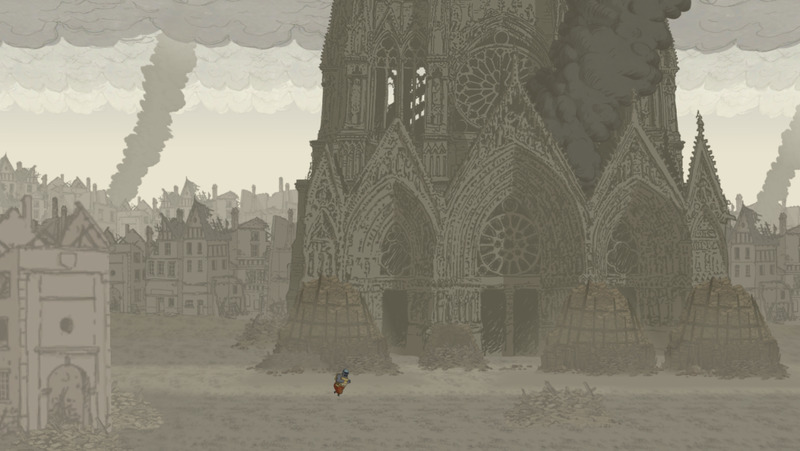 Now you're atop the cathedral, and Von Dorf is back in his zeppelin. He'll continue the grenade-hurling bit, though he now throws four rather than one. Wait for the fourth to come, as it will be a dud, and pick it up. Hurl the grenade at the engines to the front and aft of the zeppelin. Land three hits and the zeppelin will go flying out of control. Note that Von Dorf throws more grenades more often as the battle wears on, so don't wait too long before throwing. That, as they say, is that. Battle over! And chapter! Is a bug I quit the game restarted from my save then the cupboard slides over the bolt cutters correctly instead of pushing them into the fire..